Depicting perspective was always a task in which I had succeeded in my drawing course but not so much when it came to this exercise. I was sat at my table going through the drawings from the last exercise when I noticed there was a part of the living room which I hadn’t drawn and it was probably the best part of the apartment to paint for this exercise. The window to the Juliette balcony flanked by the bedroom and the bathroom door. As the brief for the exercise said I started off drawing the lines with a detail brush in a watered down mix of primary blue. At this stage everything seemed perfect. From there I went on to use washes in various strengths of primary blue to further define the positive and negative shapes. The painting was simple and at this stage everything looked perfectly in proportion. I wanted this to be a painting with a limited palette so I could keep it simple and because I wanted to keep thinks simple when I came to painting the detail I opened the bathroom door so I wouldn’t have to mess about painting the molded panels in the door. 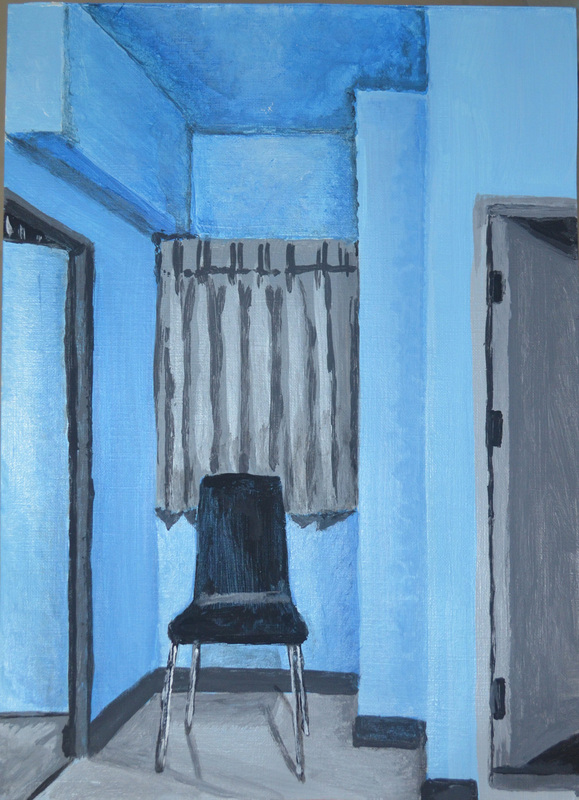 I painted the walls blue and because of this I painted over the chair with a dark wash in a smaller brush leaving the blue to show through which not only made it look like the chair was reflecting the blue of the walls but it helped give it a wooden grainy feel. I then painted the door frames door and curtains in a grey mix adding detail in black. 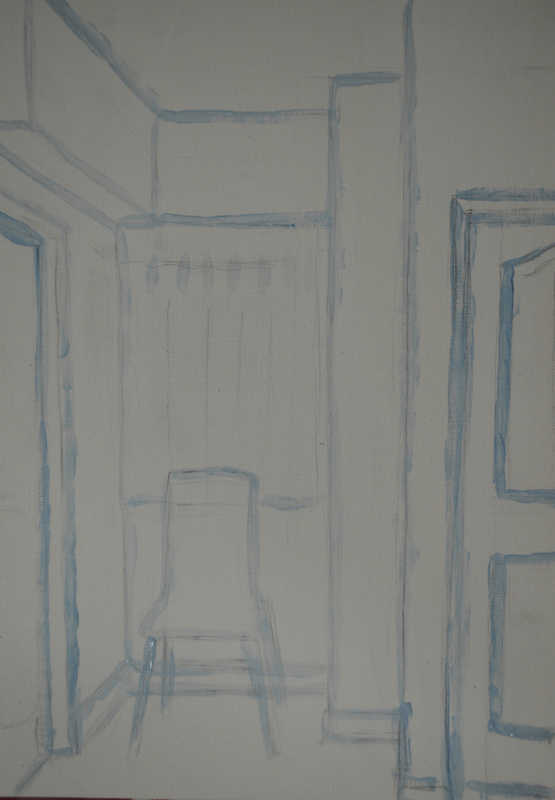 In the finished painting the perspective looks fine but the chair does look somewhat out of proportion, I’m not sure why because when I drew it in paint everything looks spot on. Because of this the doors look shorter than what they actually are, or at least the door on the leftto the bedroom. 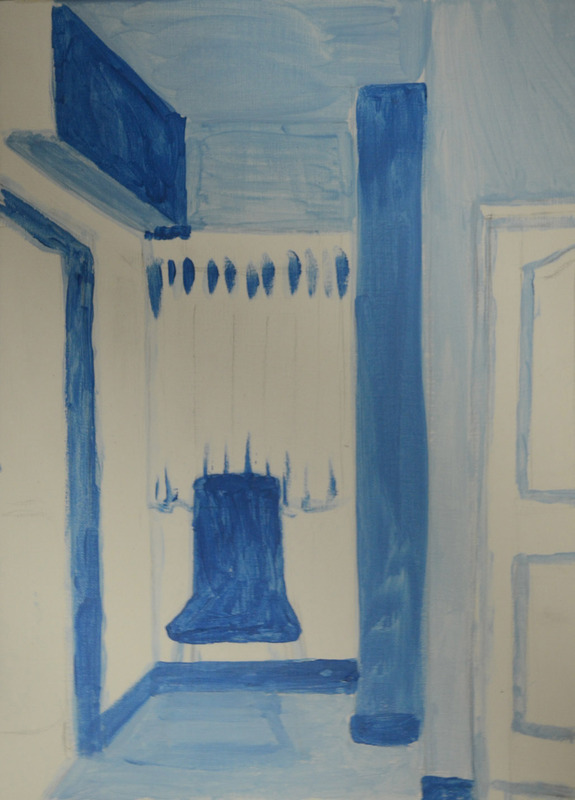 This entry was posted in 3 - Simple Perspective in Interior Studies, Coursework and tagged art degree, Bachelor in painting, distance learning, drawing and painting interiors, painting 1 oca, painting course, Simple Perspective in Interior Studies on July 24, 2015 by Mark A Smith.